I’ve been feeling bad about not organizing a bucket list of things to do before Mists arrives. I thought I had one but after taking screen shots of Theramore I realized that’s really all I had on my bucket list. 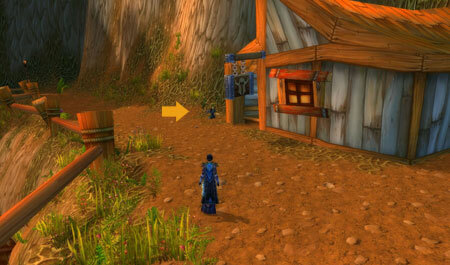 I have favorite locations in Azeroth. I’m a sightseer. 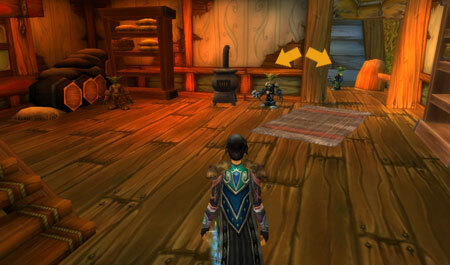 I like to hang around in isolated spots waiting for the NPCs to go off script cause they know nobody else is around. I just KNOW they’re going to do it, I just need to be patient. It hasn’t happened yet, but I’m still hopeful. I thought I’d travel to Feralas and kind of commune with an Ancient about it, seemed appropriate. 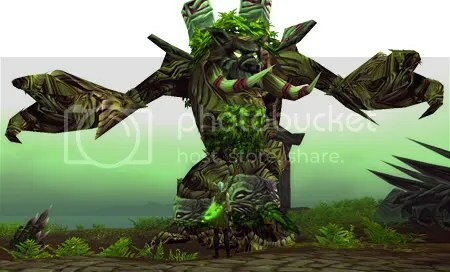 I love Feralas, I even still love Dire Maul after all the Insane grinding there. I spent some time with an Ancient at Feathermoon Stronghold in deep meditation and finally sorted things out. 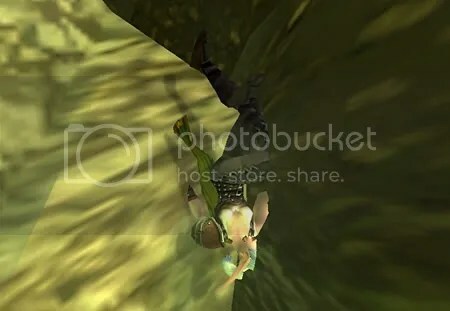 My blog should really be called something like “Go Ahead, I’ll Catch Up, I’m an Expansion Behind You” because I haven’t seen most of the dungeons in Wrath, forget about Cata dungeons. I thought about getting to 50 exalted reps but just wasn’t feeling it. So I decided to try to see as many unseen dungeons as possible … before, you know … I start dying too much. And then I found this great guide for the Lunar Festival at Achievements Ahoy, so I can do Elders of the Dungeons at the same time. I had it almost finished but it was reset by Cata. So, Ta Da! That’s it! And I might try to pick up a few exalteds along the way. Okay, mission accomplished. Thanks, Ancient One. So I was there in Feralas and I thought, you know, you can’t really come here and not visit the Twin Colossals. Yeah, well nothing is ever easy is it? The view from the top is incredible, well worth the trip. I was enjoying it, but Kalin Windflight kept pestering me about buying his parachute. Sometimes I think fishing all alone up there, all the time, is making him a little … you know, looney. 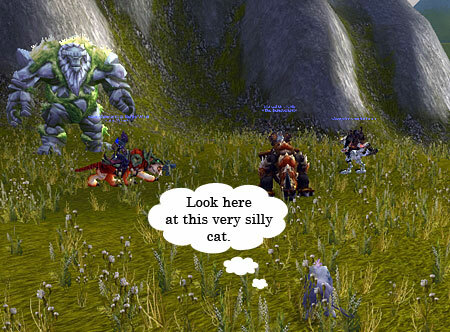 He hasn’t gotten the word yet about flying in Azeroth maybe. Anyway, I told him I didn’t need one, thanks, I’m a Druid, I can fly. I felt kind of bad. Maybe I should have just bought one. I don’t know what his financial situation is. I jumped, and yeah. I forgot I’d rebound my flight key. Dead. I heard Kalin call down, “How’s that whole I don’t need a parachute I can fly, I’m a Druid, thing working out for you?” Now that I remember, he always was a Mr. Smarty Pants. And things just got worse. I smacked into a ledge about half way down. I released and tried to fly up to my body in wisp form. Duh, can’t fly in wisp form here. I don’t know how long I tried to jump, hop and hop-jump up to my body, but I finally gave in and went back to the spirit healer and the whole thing cost me 34 gold. I should have bought his parachute. Did I learn something? Yes, no more nostalgia tripping about how good everything was back in the day. Many things were great back in vanilla, but not being able to collect your corpse and having to use the spirit healer, ugh, not one of them. And next time I visit Feralas, I’m getting Kalin back. I mean he could have thrown me a rope or something, geez. Anyone suffering from altoholicism probably knows how this feels. You get a drop or achievement on the wrong character. For example my druid wanted the Great Brewfest Kodo, but didn’t want the The Horseman’s Reins, I wanted that for my warlock and shockingly enough they both got what they wanted. My main is the only character I do achievements on. I do have two maxed fishermen and two maxed archeologists which is bad enough but any achievements the rest of my characters get are by accident. My main has been trying to get Stood in the Fire since it became available. She hung around in dangerous places, has been everywhere leveling archeology and nothing. The closest I came was flying into the Wetlands once and seeing the flames disappear. As I was questing with my Horde warlock it did enter my mind what a horrible travesty it would be if this new wet-behind-the-ears character encountered Deathwing. I then got a grip back on reality and realized, hey, they’re all unlucky me, I haven’t seen him on any character so the odds of that happening are pretty unlikely. Of course as you can see it did happen, questing in Blasted Lands, killing Ogres, the sky turned red, yada, yada, yada, you know the rest. I didn’t even see him a hill was blocking the view. Then to make matters worse she takes off for Silithus to get the dumpling recipe and sandworm meat to level cooking and almost immediately a Disgusting Oozeling drops for her. I am not bitter, my main however is furious. 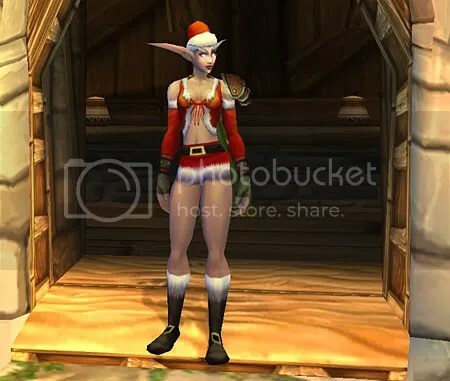 At this point she’s not even speaking to my priest because my priest parked herself in Dalaran at level 77 and lent her heirlooms to my Horde warlock. 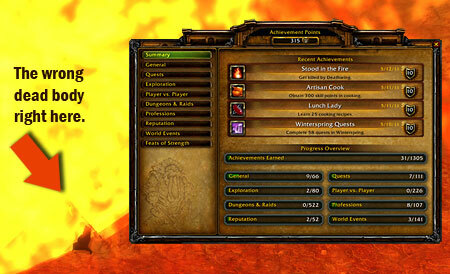 My warlock doesn’t care about achievements, she’s just excited to have reached 60 and is flying around Outland. It’s a very lucky thing that they’ll never meet, it could have gotten very ugly. 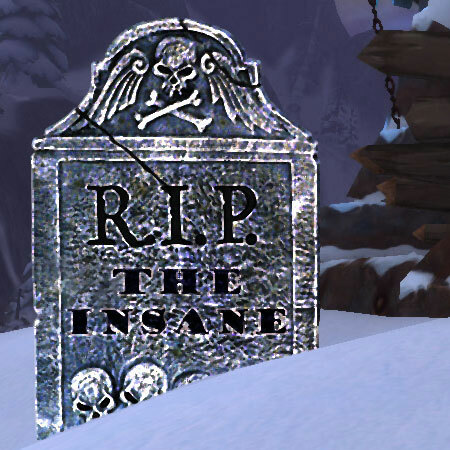 I was surprised by Blizzard’s announcement yesterday that The Insane would be staying in Cataclysm without the exalted reputation with Shen’dralar requirement. To me that rep grind was the insane part, the rest were just well tedious. I know that might not be the case for everyone. 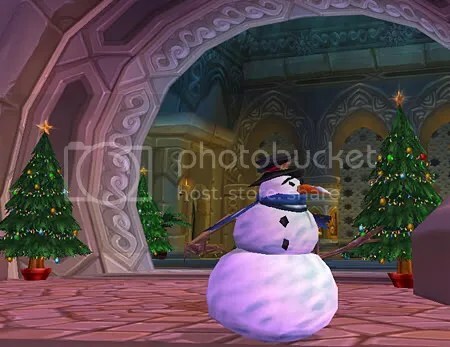 I imagine those that didn’t have a Rogue available to do the pick-pocketing for them might have felt that Ravenholdt was the worst and even with a scribe Darkmoon Faire took forever but Shen’dralar was OMG insane. Okay, bring you a libram huh? Fine, is that it? No? You want a what? You know those Pristine Black Diamonds aren’t that easy to come by but okay, I’m on my way. What do you mean “Not so fast”. 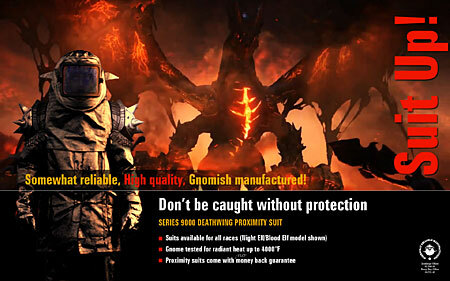 Frayed Abomination stitching!!!! Skin of Shadows!!! Freaking Blood of Heroes, you’ve got to be kidding me, you people are crazy … you’re … you’re … well … insane! Is that ALL, are we done here? Oh, you want all that with a side order of Large Brilliant Shards too, oh hey, no problem, geez. For whatever reason Libram of Rapidity was the cheapest to buy on the AH on my server. I assumed it was because no one wanted to collect Blood of Heroes but I was trying to save the money to purchase the diamonds when one was available. Still, today, months later, whenever I go to Eastern Plaguelands I feel compelled to look for Blood of Heroes. If I do find one my heart leaps in my chest, my precious, oh my precious, Blood of Heroes. It takes all my self control to NOT pick it up. I can’t leave it there though. I announce the location and I’m only satisfied when some Insane Seeker comes to retrieve it. 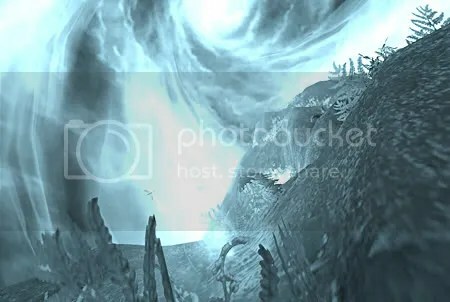 I wish there was a way to keep those lunatic Shen’dralar in Cataclysm, you really don’t know crazy unless you had dealings with Lorekeeper Lydros. As soon as I heard about the Insane in the Membrane feat I really wanted to do it. Here finally was something that would fit my bizarre play style. A great title and perfect for a solo player, nothing that required a raid group. I also had a rogue of appropriate level to do the pick-pocketing for the heavy junk boxes and a scribe to make the dark moon cards. The only thing stopping me was the part that is probably the easiest to do, The Bloodsail Admiral title. I remembered being in Booty Bay trying to turn in quests with various characters and finding the turn-in NPC dead, one time Booty Bay was pretty much a ghost town. 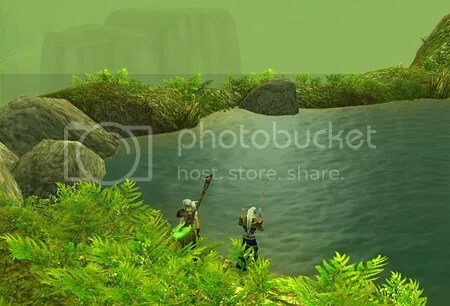 I definitely didn’t want to slaughter the inhabitants of Booty Bay and incur the ire of my fellow Alliance players or the Horde either for that matter so I sadly gave up on the idea until someone said you should be able to stealth to areas where there are a lot of Booty Bay Bruisers and just kill them. Okay I thought, I’ll give it a try and yes, it was more than doable. I found two places that worked great for me. Killing one bruiser would spawn a good group of bruisers that would keep coming directly to you. I didn’t have to go looking for them they just came straight to me. The room above is on the bottom floor of Booty Bay. There’s an auctioneer in the left corner but he never got involved. Killing the bruisers by the door would bring a whole slew of their comrades. After they stopped coming I would go upstairs take care of any phone calls I needed to make and then come back down for the respawn. The other place I used is outside shown below. It wasn’t quite as reliable as the room with the auctioneer but worked pretty well most of the time. So if the Bloodsail rep has been holding you back from completing The Insane grind before the expansion it doesn’t have to, you can easily get it without disturbing the peace in Booty Bay. 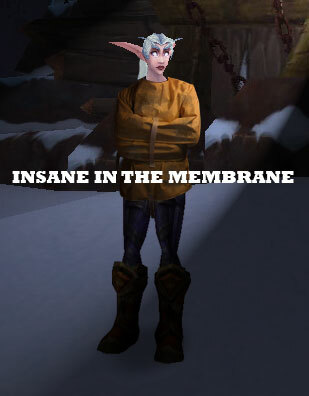 There are many fine guides out there but the most helpful to me was Insane in the Membrane By Cogsworth of Ysera-US.